Dyne Systems is your partner for superior dyno system performance. Everything we do is about making it easy for you to turn your testing challenges into success. Dyne Systems acquired Midwest® Dynamometer and Dynamatic™ Dynamometers in 2002. We are proud to be the only authorized Midwest® and Dynamatic™ Eddy Current dynamometer manufacturer and service facility in the world. Solving complex problems. Through a creative, collaborative culture, coupled with an exceptionally experienced and knowledgeable staff, Dyne Systems continuously embraces and overcomes your evolving challenges. Maximizing uptime, productivity and longevity. 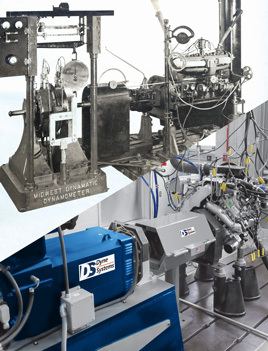 Long and widely known for quality, strength and durability, Dyne Systems’ comprehensive line of dynamometer technologies delivers greater value over time in the form of lower downtime, superior performance and higher Return On Investment (ROI). Helping you make the most of your testing equipment. Dyne Systems’ proactive, collaboration process, along with deep product and applications knowledge, helps meet your current and future needs and optimize your testing equipment throughout its lifecycle. By applying these strengths, we’ve been helping companies like yours get greater performance, durability and return on investment in engine and equipment testing since the 1980s. The result is the best overall value for you today – in terms of both your testing performance and your company’s bottom line.